Fish Curry Rice is a traditional Goan meal. It is cooked & prepared almost every day in every Goan home. Mackerel is known as ‘Bangde’ or ‘Bangude’ in Konkannim. Mackerel is cheap & easily available but above all nutritious! It is an oily fish which is rich in omega-3 fatty acids. It is eaten & enjoyed all over the world. Besides, mackerel fish adds a lot of flavor to the curry. The perfect accompaniment to goan fish curry rice is rechado mackerel or plain pan fried masala mackerel or fried prawns. Besides, you also have foogath as a side & some Goan pickles with your plate of fish curry rice. 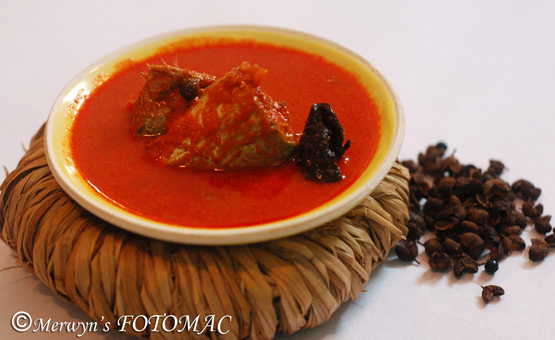 We Goans love our fish curry to be less pungent & spicy. In fact, we like it to be smooth but tangy & with balanced spice. 2 tbsps. Coriander Seeds or pwd. First clean the fish by removing the gut, gills, scales, cutting of the fins & tail. You may do it yourself if you are comfortable with it or get it done by the fisher monger. Wash the fish well & then cut into 2 or 3 pieces. Apply some salt & turmeric to the fish pieces & keep aside for about 20 mins. Soak the Kashmiri chillies in luke warm water to soften. Meanwhile prepare the masala paste. Grind together soaked Kashmiri chillies along with the water, scraped coconut, coriander seeds or pwd., turmeric pwd., cumin seeds, ginger, garlic, chopped tomato, half the onion in the masala grinder to a fine thick paste. Transfer the paste to a bowl, rinse the grinder with water & reserve the water to be used in the curry. Heat a deep pot/handi/dekchi or a mud pot with vegetable/coconut oil till hot. Reduce heat & add the remaining chopped onions. Saute till the onions are soft & translucent. Add the masala paste & sauté till rawness disappears. Add the reserved water & additional water depending on how thick or thin you want your curry to be. Stir well. Add green chillies, tefla, a pinch of sugar & bindi sol to the curry. Mix well, let it come to a boil & then gently lower the fish into the curry. Do not stir. Let the curry come to a boil again. Lower the heat & gently stir the curry. Adjust salt to taste. Let it cook & simmer for about 10 mins. 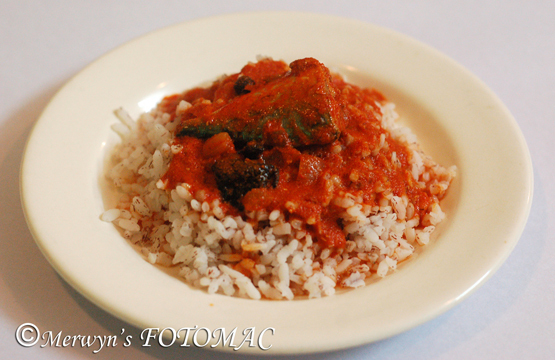 Serve hot with steamed rice or Goan boiled rice. You can use prawns, pomfret , king fish or any other fish of your choice to prepare this curry. Do not over cook the fish or it will disintegrate into the curry. You may use a combination of scraped coconut & coconut milk. If you do not like excess coconut then you may use half coconut. You can grind the masala paste; use warm water to extract juice & then make curry. You can use only tamarind pulp or only tomatoes, bimlees or bindi sol which is also known as sol/sola/amsol/kokum. Using coconut oil gives a good flavor. Coconut oil is used to prepare traditional curries. You can prepare the curry without oil by thinning the masala paste & directly boiling it. while making fresh prawns curry, do we use the prawns heads , can we make use of them in the curry or discard them., if we can use them the how? pls tell me. I tried out this recipe, and it came out amazing.. thanks for sharing.. it brought some childhood memories back. Dear Aunt Hilda, I have been hunting for the authentic goan fish curry recipe for years. I came across your website today, will surely try it… thanks.a lot..
All recipes are excellent !! !